Description: double spout bowl, ID number missing, M.N.A.A.H.-Lima. Chronological Era: Early Intermediate Period (EIP), Nasca 2 Phase. 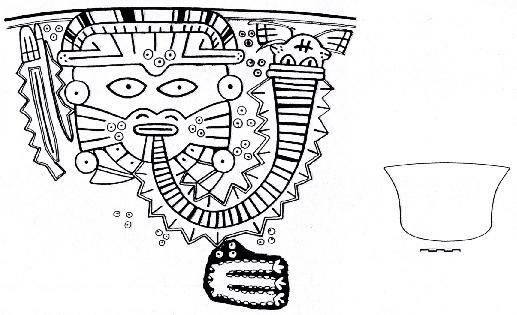 Iconographic Features: Feline Head with Snake Rays depicted with feline head, two paws and serpents. Two serpents emerge from the mouth. 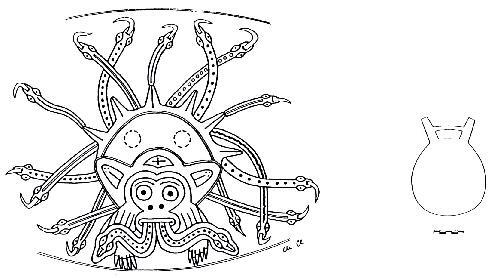 It wears a headdress in the shape of a jagged serpent body towering above (sky serpent, rainbow?). Interpretation as celestial body. Iconographic Features: Feline Head with Snake Rays depicted with feline head and serpents. 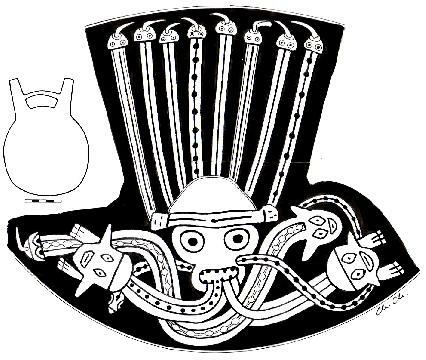 In addition, serpents emerge from the mouth and the face. It wears a forehead ornament. Black-painted background may indicate the night. Interpretation as celestial body. Iconographic Features: Surrounded Feline Head consisting of a feline head with two paws framed by serpents. Black-painted background may indicate the night. Interpretation as celestial body. Chronological Era: Early Intermediate Period (EIP), Nasca 5/6 Phase. Iconographic Features: Surrounded Feline Head consisting of a feline head framed by angulated serpents. It wears a trident crown stitched up the front, a classic Harvester attribute. Interpretation as celestial body. Painting recalls Paracas representations of Rayed Faces. 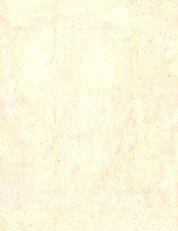 Description: textile with shell, drawing after D’Harcourt 1936. 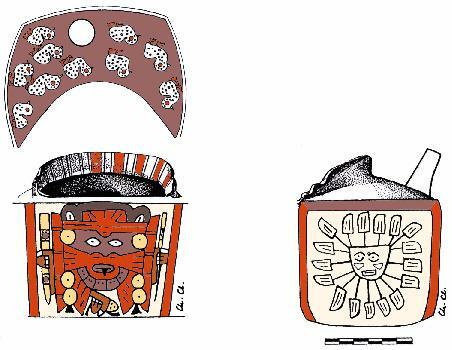 Chronological Era: Early Intermediate Period (EIP), Nasca 5/6 Phase (?). Iconographic Features: Surrounded Feline Head consisting of a feline head framed by angulated serpents. It wears a forehead ornament. Interpretation as celestial body. Description: spout-and-bridge bottle (detail), C-60071, M.N.A.A.H.-Lima. Chronological Era: Early Intermediate Period (EIP), Nasca 7 Phase. Iconographic Features: very rare modeled version of a Surrounded Feline Head consisting of a feline head framed by four striped arms. It upholds a reed boat on which a naked woman (of the Principal Couple?) lies. Interpretation as celestial body. Description: effigy vessel, C-12439, M.N.A.A.H.-Lima. Iconographic Features: Feline Face and Surrounded Head (Proulx 2007, 112) as motifs on the wall of an architectural structure. Feline Face consists of a feline head and three arms holding a club, a spear and a trophy head. Surrounded Head consists of a face framed by peppers. Interpretation of both supernatural beings as celestial bodies. Iconographic Features: Feline Face consisting of a feline head and three arms. It holds two bloody clubs, jagged rays and a trophy head. 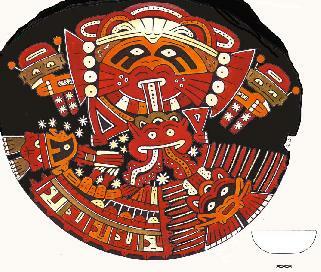 On its right a Surrounded Head (Proulx 2007, 112) appears. Association with ducks and tocapu-ish motifs. Interpretation of both supernatural beings as celestial bodies. Iconographic Features: Feline Face or (Standing) Anthropomorphic Mythical Being consisting of a feline head and two arms. It holds two trophy heads and a serpent. Description: cup bowl, C-32976, M.N.A.A.H.-Lima. Iconographic Features: Feline Face consisting of a feline head and two arms. It holds a trophy head and a human holding a club. His torso reveals sets of ribs indicating starvation. On the right Horrible appears. Black-painted background may indicate the night. Interpretation as celestial body. Old repair evident. Description: double spout bottle, C-09348, M.N.A.A.H.-Lima. Iconographic Features: Feline Face consisting of a feline head, two arms and three serpents which are attached to the head. It holds a trophy head and a human holding a club. His torso reveals sets of ribs indicating starvation. On the right Feline Hawk appears whose wings are covered with trophy heads. Interpretation of Feline Face as celestial body. Description: double spout bottle, C-09668, M.N.A.A.H.-Lima. Iconographic Features: Feline Face consisting of a feline head, three (!) arms and the upper part of a human body. 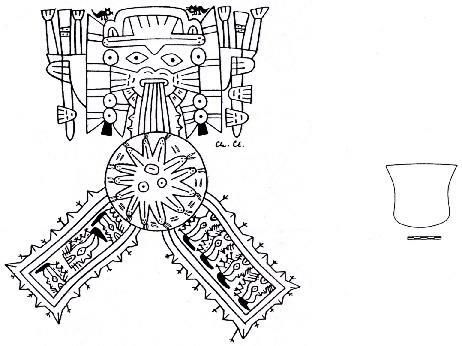 Arms depicted with stars enclosed. Snakelike streamer (= extended tongue) emerges from the mouth, terminating in a feline head which in turn bifurcates into two serpents, the left one terminating in Horrible Bird, the right one terminating in Feline Hawk. Feline Face holds a trophy head and a human whose torso reveals sets of ribs indicating starvation. Headdress may represent the rainbow. Black-painted background may indicate the night. Interpretation as celestial body. Description: bowl, ID number missing, Museo Regional de Ica. Iconographic Features: Feline Face consisting of a feline head, two human arms and two human legs. Arms depicted with stars enclosed. Snakelike streamer (= extended tongue) emerges from the mouth, terminating in a feline head which in turn bifurcates into two serpents, the left one terminating in Horrible Bird, the right one terminating in Feline Hawk. Feline Face holds two trophy heads. Headdress may represent the rainbow. Black-painted background may indicate the night. Interpretation as celestial body. Iconographic Features: Feline Face consisting of a feline head and two human arms. It holds clubs, spears and forehead ornaments. 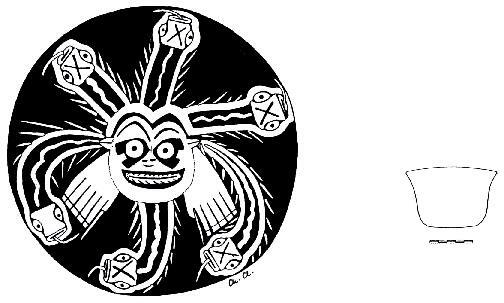 Snakelike streamer (= extended tongue) emerges from the mouth, terminating in a circle depicted with Rayed Face enclosed. The circle in turn bifurcates into two bubble-like extrusions, each containing foxes. Fox legs attached to the extrusions (indicating moving forward?). Two rodents close to the head of Feline Face. Interpretation of Feline Face as celestial body. Related Themes: Click link to see related item(s) CL 94, 95, 110, 103, 104, 105, 106, 260, 281, 282, 283, 284, 285, 286, 287, 289, 290. Iconographic Features: Feline Face consisting of a feline head and one “snake arm”. Snakelike streamer (= extended tongue) emerges from the mouth, terminating in a trophy head with paws. A (San Pedro?) cactus indicates the desert environment or the loma region. Interpretation of Feline Face as celestial body. Related Themes: Click link to see related item(s) CL 94, 95, 110, 103, 104, 105, 106, 260, 281, 282, 283, 284, 285, 286, 287, 288, 290.